The National Reconnaissance Office has successfully deployed vital replacement spacecraft over the past seven months to rejuvenate nearly all of its satellite constellations, most recently putting an ocean surveillance duo into orbit last week. 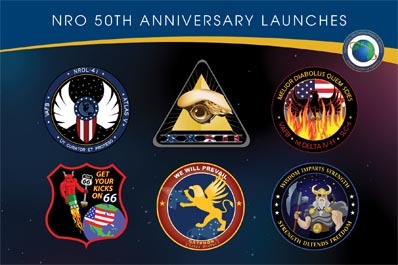 While celebrating its 50th anniversary, the secretive government agency responsible for designing and operating the U.S. fleet of spy satellites conducted this remarkable launch surge in a tightly packed timeframe using Atlas 5, Delta 4-Medium and -Heavy rockets, plus the light Minotaur 1 vehicle. Beginning on Sept. 20, an Atlas-501 rocket roared from Vandenberg Air Force Base in California carrying the first in a new-generation of radar imaging satellites that follow the heritage Lacrosse program. Next came the "largest satellite in the world" atop a Delta 4-Heavy rocket on Nov. 21 from Cape Canaveral, Florida. This eavesdropping bird has a gigantic antenna for gathering signals intelligence. Another Delta 4-Heavy rocket, this time launching from Vandenberg, flew on Jan. 20 with the crucial new Keyhole spacecraft for the nation's sophisticated electro-optical imaging system. An experimental research and development payload for the Rapid Pathfinder Program was shot into space by the Minotaur 1 on Feb. 6 from Vandenberg. Then, a Delta 4-Medium+4,2 launcher with a Satellite Data System bird to relay communications between the reconnaissance spacecraft and ground stations was sent aloft from Florida on March 11. The capper occurred last Thursday when two satellites were launched together atop an Atlas 5-411 rocket from Vandenberg to refresh the Naval Ocean Surveillance System, or NOSS. Satellite-tracking hobbyists reported spotting the formation-flying craft and confirmed them with further observations Monday night. "NOSS satellites track ships at sea through their radio transmissions. The first two generations, launched between 1976 and 1996, consisted of several triplets that orbited in close formation. Analysis of the difference in time of arrival of a signal at each member of a triplet enabled determination of the location of the source. Third generation NOSS accomplish the same using pairs of satellites," said Ted Molczan, a satellite-tracking hobbyist. Thursday's launch was the fifth for this current breed of NOSS featuring satellite duos instead of the previous trio arrangement. Atlas rockets have deployed this generation over the past decade beginning with two missions from Vandenberg that went up in 2001 and 2003 aboard Atlas 2AS vehicles, then two flights from Cape Canaveral that flew on the Atlas 3B in 2005 and an Atlas 5 in 2007.